Like the other seasonal holidays, whilst Easter does see the shelves of our favourite discount stores filled with suitable bits and bobs, unlike Halloween, these don’t tend to be of any use to the average wargamer. Having purchased a small wicker basket from Poundland, with the intention of filling it with a veritable cornucopia of small chocolate goodies for my wife, I found that I’d left it a touch late to buy the ‘goodies’, so had to buy normal eggs instead. This left me with an unwanted and unnecessary item. As I detest waste and have absolutely no shame, I took it back to Poundland and exchanged it for something else…because that’s how I roll. Five injection-moulded hollow plastic bath toys, representing various farm animals, in suitably restrained colours. For a £1, so that makes them 20p each. Bargain! However, looking at the pig next to my Ghostbuster figure…. 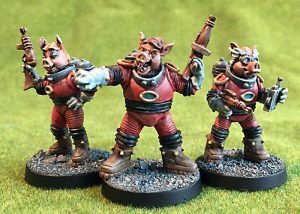 And remembering the beginning of the second Toy Story, where the evil Dr. Porkchop has a vast pig-shaped spacecraft, I thought that this would make a good shuttlecraft for….Pigs in Space! 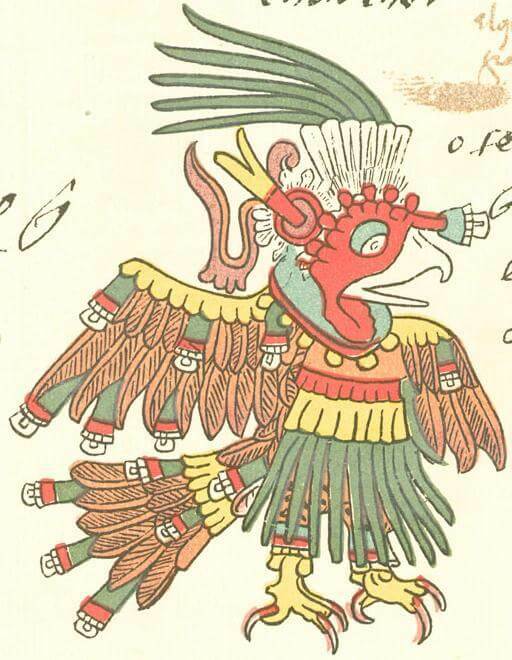 I’d previously posted about my intention to add an Aztec-inspired villain to my Ghostbusters games on 1st April – and this was not a prank, although the subject matter may have led people to believe it was… You can read all about “The Jewelled Fowl” here. Bearing in mind that I had already made a start on this project when I posted on 1st April, the fact that on 28th March I was notified from my Blog feed that Antediluvian Miniatures had just released their Conquistadors of Mictlan range in their shop, which contains Conquistador Zombies, Mictlan Zombies, Mictlan Jaguar Warriors and Mictlan Liches, seemed rather…serendipitious. 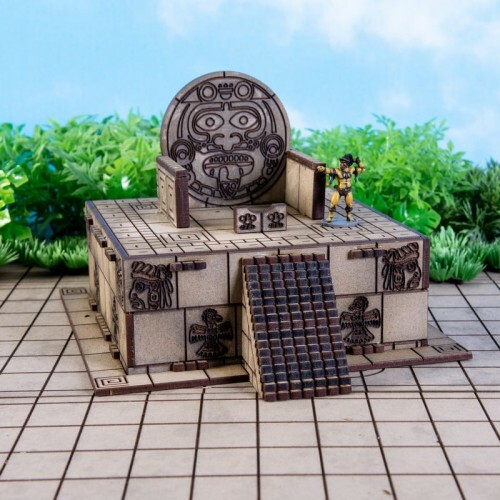 Firstly, the American laser-cut MDF building company Things From the Basement are now working with 4Ground in the UK and one of their new ranges is The Lost Archipelago range, which I suspect was inspired by the Frostgrave – Ghost Archipelago game, but is suitable for all your Incan, Mayan and Aztec needs. Then there was the injection-moulded plastic scenery from Archon Studio, who have some kind of link with Prodos Games. This system, called “Rampart” is a modular scenery system that was launched on Kickstarter and has a delivery date of May 2019, but you can enter a late pledge via the Archon Studio shop, the lowest level being the $49.00 starter pledge. 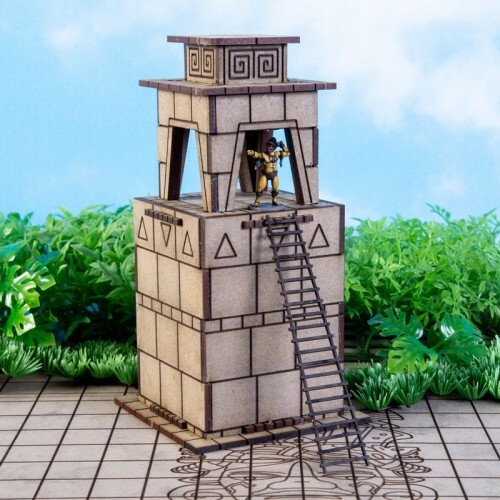 As I am a big fan of plastic terrain items, especially stuff of this nature, this bears keeping an eye on, as I can see several uses for this kit. However, we will have to see if they deliver on their promised shipping date and how soon after this the items appear for general release. 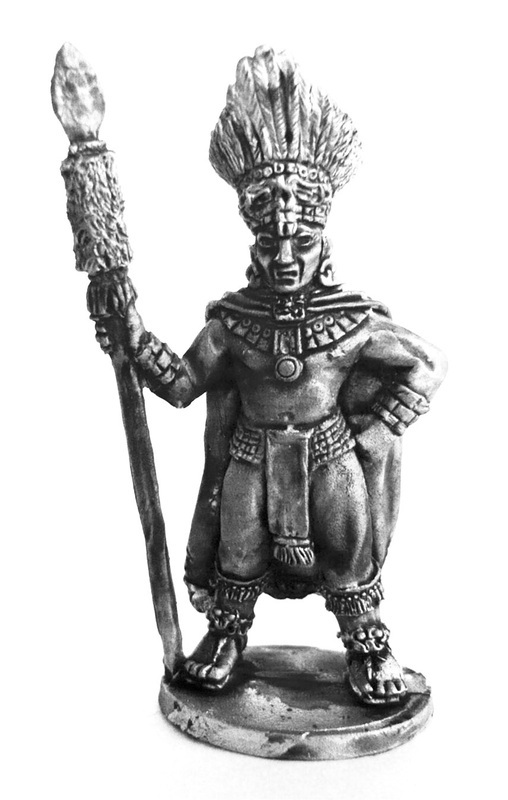 All items that could enhance my intended venturing into the realms of Aztec horror…and all still with their manufacturers, as I have a tiny budget at present. However, when has that ever stopped me in the past? Let’s see how the project is (slowly) progressing so far. The “Blighted Reavers” from the Arena of the Planeswalker boxed game had most of their mold lines removed and a generous (perhaps a little TOO generous) layer of sharp sand added to their bases, then were undercoated in white. They were then given a couple of thin coats of grey, then their loincloths were painted beige and one of them (as a test) had his torc and bracelet painted gold. Still a little darker than I originally envisaged, but a touch of high-lighting will sort this out. With my human form Chalchiuhtotolin, he’s now been based and undercoated, but only his head-dress currently painted, as I was waiting for his base to dry properly. I decided to go with a the standard turkey colouration initially, which appears to be blacks, whites and greys for the plumage, with a red and blue head. I will be introducing a hint of green to the proceedings, as he is the “Jade Turkey” and am considering whether this would be better done as a green ink wash over his feathers, giving a slightly shiny, metallic look to them. Currently undecided on this, but was suitably impressed with the detailing on this cheap plastic toy, as it has come out rather nicely. Having watched with interest as Steve Gilbert has taken a bunch of 54mm plastic figures (including cheap plastic army men and cowboys and indians sourced from China at 4p a figure) to re-fight the Anglo-Zulu war, over on his new blog Reveille, this has got me out of my gaming “funk” and re-focused my mind on what I want to achieve for the fourth year of Carrion Crow’s Buffet. As you can probably gather from the title, I have returned to one of my true loves, that of the boys in beige themselves, the best, the beautiful, the only…Ghostbusters! So, 2019 will see a return to the Ghostbusters project, as I complete painting up all the figures I have bought specifically to play GB games with and actually play some games with them. As my gaming budget has taken a bit of a hit, everything “new” for this project will be re-purposed from elsewhere or some of my usual innovative and inexpensive build solutions. So, the underlying premise of Ghostbusters, as a horror/comedy, is that whilst the ‘baddies’ should be somewhat horrific, they should also be a touch ridiculous. Take the Stay Puft Marshmallow Man – he’s quite cute, being the mascot of a confectionary company, but as the avatar of a “moldy Babylonian Sumerian God”, dedicated to destroying the World, he is pretty terrifying too. Therefore, in order to create a new foe for MY Ghostbusters franchise, I need to embrace this premise and come up with something that is in equal parts terrifying AND amusing. I have done this once before, for the tabletop Ghostbusters RPG, where a franchise based in Reading, Berkshire had to deal with various Christmas-themed entities – The Ghost of Cows Past haunting a McDonalds, the Ghost of Christmas Presents – a giant jack-in-a-box trying to wrap the world and, finally, the big bad himself, Father Solstice – the Ghost of Christmas As It Should Be, the spirit of a Druid burnt at the stake trying to return the winter festival to its pagan roots. It was very silly, but a huge amount of fun, as the players embraced their pre-generated characters and just went for it. So, when looking for a suitable villain, I was thinking along the lines of something turkey related and one of my bizarre google searches led me to Chalchiuhtotolin, the Jewelled Fowl, an Aztec God of disease and plague. Super-glued to a pre-puttied two-pence piece base, which, for our non-UK readers, is a copper coin approximately 25mm in diameter, this hard rubber toy is about 2″ (50mm) tall. Quite nicely detailed, it just needed a few mold lines removed and is now ready for painting. To give a sense of scale, here is Chalchiuhtotolin in full-on turkey avatar mode (a sentence you never thought you’d ever read) with his Aztec ghoul minions, which are about 30mm tall, so pretty beefy themselves. I need to base up his human avatar form and then we’ll be into painting him and his minions up, to bedevil my Ghostbusters. Weird, unique, yet interesting content…I’m back, baby! In my last but one post (I’ll Put a Hex on You…), I discussed my plans regarding re-purposing my Heroscape hex terrain to make it less ‘cartoon-y’ looking. I have decided to christen this “Re-Scaping” because…I can. 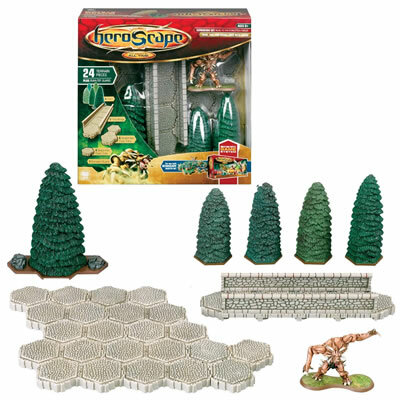 Now, I am aware that not everyone is as familiar with Heroscape as myself, so I thought I’d do a quick history bit first. It was originally published/released in 2004 by Milton Bradley and was a complete turn-based miniature wargame, which came with 30 pre-painted miniatures. The main difference from other games of this ilk is that it came with interlocking hex tiles, which could be combined in whatever fashion you chose, to create your battlefield. Lego for wargamers, essentially. Until it was discontinued in 2010, several expansions were released, introducing different coloured tiles to represent different types of terrain, including dungeon, snow and lava field tiles. At one point, I had a copy of every terrain expansion released, bar the castle set, but various financial issues resulted in me selling off the Volcarren Wasteland (lava-themed), Thaelenk Tundra (snow and ice-themed) and the Battle for the Underdark (Dungeon-themed) sets. Starting from top left and going clockwise, the green/brown tile is a Grass tile and the grey/brown is a Stone tile, both from the Rise of the Valkyrie base set. Grass tiles are those you get the most of. Next we have a cobbled Road tile, from the Road to the Forgotten Forest set. You get about 20 of these, so not enough to cobble the entirety of Blackwell. The black tile is an Asphalt tile and the light grey is a Concrete tile, both from the Marvel base set The Conflict Begins. I ended up with three of these sets, as The Entertainer was selling them off at £10 a set. The two-tone green tile is a Swamp tile, from The Swarm of the Marro set and the yellow tile is a Sand tile from The Arena of the Planeswalkers set. Typically, each type of terrain comes in 1-hex, 2-hex, 3-hex and 7-hex tiles, with certain variations, like the 24-hex Grass tiles. Those who are fully conversant with the game and the sets I have mentioned will have noticed that one type of terrain tile is missing – the cream/brown Sand tile which featured in the base set as well as a few other places. The bottom tiles are a light grey concrete tile on the left and a dark grey Road tile on the right. Above them is the ‘soft taupe’ tile, which is a pretty similar colour to the Concrete tile. After some gnashing of teeth and a bit of compound swearing, I resorted to Plan B – in which the B stands for ‘Burnt Umber’. Utilising a bottle of Docrafts Acrylic of this hue, I grabbed the 24-hex tile that I’d sprayed with ‘Soft Taupe’ and gave it a liberal coating of this, as a test piece. So, as I now have a solution, I just need to give all my ‘Soft Taupe’ sprayed tiles a coat of Burnt Umber and I will have my first set of Re-Scaped tiles, which I think shall be dubbed Mud tiles. Should double up as patches of earth, dirt roads in the countryside or possibly compacted dirt roads in urban environments. Of course, the comparison with the original Grass tiles now shows that they need Re-Scaping too. Luckily, Wilkinson’s does have at least 3 different shades of cheap green spray paint, so hopefully at least one of them will be a closer match to the colour I want. I shall finish up with a small piece of good news – it appears I will be attending Salute this year after all, so keep your eyes peeled for the grumpy old crow stalking the aisles and descending upon the Bloggers Meet in a flurry of feathers. Those who regularly follow this blog will know that I’m not usually the sort to buy boxed games. Not only do they tend to be somewhat pricey, but they also don’t really represent good value for money, in my opinion. And as I don’t have a huge gaming budget, they merely represent ‘nice ideas’ rather than potential purchases. You read that correctly…£8.48 for a boxed wargame with thirty-five plastic miniatures…even if you don’t actually ever play the game, that works out at approximately 24p per figure. Bargain! However, as I’m not known for knee-jerk purchasing, why exactly did I get this game? Well, whilst it may be branded “Magic the Gathering”, this is just a variation of Heroscape. The only real difference I can see from reading the rules is that your hero character – the Planeswalker – can cast a certain number of spells per turn, as well as having special abilities like a standard Heroscape character. The movement, dice rolling and general look of the ‘army cards’ is very reminiscent of original ‘Scape, which is unsurprising really, as this game was written by Craig Van Ness, the chap responsible for the original game. Six interlocking cardboard tiles, that cover an area of just over two feet square. The tiles feature pre-printed artwork depicting desert wastes with water features, and can be rearranged is several different configurations, depending on the particular scenario you’re playing. You also get two cardboard ruins (not shown) and two 3-hex sand tiles and 2 1-hex sand tiles – which ARE actual Heroscape tiles, but in a solid yellow colour. But let’s move on to the figures. As Magic the Gathering has five different types of mana, unsurprisingly there are five factions, one for each colour. Each faction gets a pre-painted Planeswalker figure and two squads of three figures, representing the forces that particular faction can bring to bear. Next we have the Black Planeswalker, and her two squads of Undead – three axe-wielding skeleton/zombies and three ghoul/ghast types. Next we have the Green Planeswalker and her elven archers and nature elementals. The Blue Planeswalker and what it apparently illusionary doubles and “Leyline Phantoms” – which are the four-armed demon-types. And lastly, the Red Planeswalker and her squads of phoenixes and firecats. Each individual figure is a unique sculpt and is cast as a one-piece in a the relevant coloured plastic, except for the Planeswalkers themselves. Other than the Rhino-men, who could have been cool – but just aren’t, all the figures are pretty decent sculpts. Some of the bases don’t sit flat, due to how they’ve been shipped, but as they plastic is fairly flexible, the old hot water/cold water trick should restore the slightly warped back to their correct poses. Whilst the overall theme of the set is Fantasy, I think it’s fairly obvious that once you’ve got these figures, what you do with them is up to you. I’m currently trying to decide if the ghoul types would be better used as minions of Skeletor or some kind of Aztec tomb-guardians. Lots of figures, lots of possibilities, not much outlay – typical Jez-type post. Should you want a box yourself, it can be found here. So, having discovered that my ‘cheap and cheerful’ vinyl gaming tiles have not stored well and need replacing before I can venture back on to the streets of Blackwell, I cast my mind through my ‘mind cupboard’, where I memorise all the gaming stuff wot I’ve got, to see what alternatives I already had. However, this did lead me down the avenue of thinking about my collection of Heroscape hexes in general. 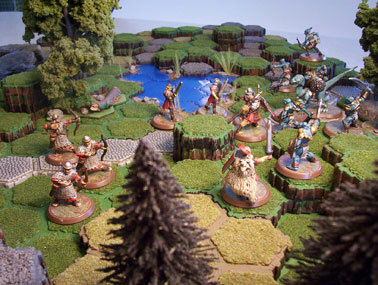 I like the modularity of them, but am envious of those who play on detailed battlemats or custom boards…so was there a way to customise my existing Heroscape hexes to make them less plastic-looking and more game=board-ish? As the Marvel Heroscape ‘concrete’ and ‘asphalt’ hexes are uniformly one colour, I was thinking of using some cheap spray paint (hobby or car) to re-colour the ‘grass’, ‘sand’ and ‘stone’ hexes, so the grass hexes would be all green, the sand hexes would be all yellow and the stone hexes would be all dark grey. A further application of stippling or sponging in a lighter shade on the tops would then give the illusion of flocking, but without little bits dropping off all over the floor. So, if all goes according to plan, I get a modular battlefield that looks closer to those wonderful yet expensive rubber mats that all the cool kids are playing with, for the price of a couple of cans of spray paint. Of course, that still doesn’t solve my cobbles problem, but moving slowly forward is better than not moving at all. Yep, that’s right, I’ve been unleashing my inner vision and opinions on hobby-related stuff for just over 4 years! But regular visitors will have noted that I’ve been rather quiet of late, both here and on as a visitor elsewhere. This is not entirely through choice, as 2019 has proved somewhat challenging – in respect of both time and finances. Combine this with a…financial miscalculation…on my part regarding certain monies payable to HMRC and I find myself in somewhat of a hole. When you have various personal issues hanging over your head, like the allegorical sword of Damocles, it’s not surprising that getting some miniatures out and either painting them or playing a game with them is not top of your agenda. Especially when what free time you have is either spent searching for alternative employment or cataloging a reasonably sized comic collection, with a view to selling it on (other than the bits I simply cannot possibly part with, naturally). In respect of this blog, and hobby-related content for it, it means that posts may be somewhat infrequent and there will be little in the way of ‘new’ content, as my hobby budget has been reduced to zero for the foreseeable future. However, this does mean that I will be concentrating, when time permits, on completing those figures I already own, those projects that have been started…and not finished and “making good use of things that I find”. So, please bear with me…normal service will be resumed as soon as possible. I must first apologise both to regular visitors to this blog for the lack of content over the last couple of weeks and to those whose blogs I follow for not posting any comments. I do have a valid reason though – I was out of the country from New Year’s Eve until last Thursday, so wasn’t really doing anything gaming-wise and didn’t have reliable cost-effective Internet access. That’s right, boys and girls, the Crow spread his wings and flew (with a little help from British Airways) across the Atlantic and arrived in New York City in time to potentially join the thronging masses assembled in Times Square to watch the ball drop. However, we wisely decided that rather than attempting to breach the barriers set up by the NYPD to limit the revellers on the streets (they DO carry guns after all), we’d watch it on the TV in the hotel room instead. And, comparing the fireworks and general spectacle of New Year’s Eve in London, I was somewhat under-whelmed. That aside, the Big Apple did not disappoint. As we were only there for three days, we weren’t able to do everything we wanted and some things took longer than we anticipated – I’d say we probably did about two-thirds of the things on our combined “to-do” list. But I have been up both the Empire State Building by day, from which managed to take this photo of a rather iconic NY landmark…. and the Rockefeller Centre by night, visited both Macy’s and Bloomingdale’s, wandered about Grand Central Station, ridden the subway, walked partway across the Brooklyn Bridge, visited the 9/11 monument and museum and eaten a grilled cheese sandwich in Central Park whilst watching members of my family ice-skate. I also watched members of family skate at the base of the Rockefeller Centre and Bryant Park – not that I can’t skate myself, I’m just not as confident as the others and all the rinks were rather busy. I’ve eaten both pretzels and hot dogs purchased from hot dog stands, slices of $1 ‘pie’ and numerous almond croissants – which seemed to be my go-to breakfast whilst in New York. I took a huge number of photos, of which I’m not going to bore you with, as these were ‘holiday’ photos, rather than reference photos…except for a couple. Apparently, fire hydrants in NYC are black and silver, rather than red or yellow, as I had assumed. Now I know, any future hydrant builds will be this colour if destined for New York. Yeah, baby! Who you gonna call? An lovely start to the New Year, courtesy of some very generous relatives. I will be catching up on all the posts I missed during my digital exile, so expect to see a few comments popping up in the next few days. Happy New Year to you all and join me next time, as we see exactly what’s on the menu at the Buffet during 2019. Whilst I know it’s been almost a month since my last post, I do have a valid reason. The agency that sourced the contract that I was supposed to have started on 26th November telephoned me a WEEK before it was due to start, to inform me that it had been cancelled. This caused consternation in the House of Crows and much scrambling about to ensure that I actually had some kind of employment in the lead up to Christmas. I DID manage to secure another contract, but am commuting via car to Aylesbury every day, rather than by train to London. Not ideal, but better than no work at all. However, once this was secured and I had completed the first week on site, I felt I could relax slightly and take a look at what models/projects I had outstanding and what would be the best thing to progress with. As Doctor Who has been on my mind of late, both because of Simon’s showcase of those Black Tree and Warlord models he’s been painting over on his Fantorical blog AND the adventures of the latest incarnation of the Doctor have been airing here in the UK (for more on my considered opinion on this series, you can read my views on my Corvuscope blog – however, those of a delicate sensibility may wish to avoid this, as there is a little bit of swearing – which I refuse to apologise for), I did consider completing some of my half-finished DW figures. But then I changed my mind and decided to make a start on a couple of resin models very kindly gifted to me by Dave Stone of Wargames Terrain Workshop. Whilst I’d been sitting on these for a while and had already earmarked one of the models for a particular project, I realised that another piece, when painted appropriately, could also be used for the same project. As I’d decided that the Digestion Pool was going to be re-purposed as a terrain feature from the Ghost World, accompanying my Soul Takers (see here for details), there was only one colour the contents could be…pink. That’s how far I have got with the simplest of the two models, as the other one took a bit more time and several coats of paint until I got it to a point where I was happy to leave it. So the Post-Apocalyptic Falcon is going to become the transport for my Vin Disesel inspired Ghostbuster, as he needed a beefier car than the 1950’s style ambulance I used for my Ghostbusters main transport. Which meant it had to be white – ideally gloss white. As my previous Plastikote Gloss White had set hard, due to an imperfect seal, I had replaced it with some Tamiya Gloss White. The only problem with this is that it’s not particularly thick and as my matt white had run out, I had to do several coats to get it to a stage where it started to actually look white. rather than dirty grey. If you look at the windows of the car, you’ll see what it originally looked like after one coat. Still needs at least one more coat, but at least it’s glossy white now. The under carriage, wheel interiors, fenders and engine were all given a coat of GW Chainmail and the rear tanks were given a coat of what Docrafts like to call Dark Grey. which is actually a fairly light grey. The idea is that these tanks will end up yellow, with hazard symbols on. I’ll have to check my Haynes Ectomobile Owners’s Manual (yes, such a thing does exist – and covers all three versions of the Ectomobile, including the wrong one) to decide what they actually contain. So, it may not look like I’ve progressed very far, but it’s certainly more hobby-stuff than I’ve done over the last couple of months, so it’s better than nowt. Join me next time for further progress on this project. Last Saturday saw my annual visit to our local wargaming show here in Reading – Warfare, run by the Wargames Association of Reading. Even before I started attending Salute (which has now become my other gaming show), I would always attend this one, as it’s really close, gives me the opportunity to see the models up close and, as it occurs just after my birthday, I usually have a few spare pennies to spend. Now, Warfare takes place in the Rivermead leisure centre, spread over four separate rooms. There’s plenty of space in the competition/club demonstration room, which takes place in the indoor bowling green, but traders hall always seems rather cramped, as the aisles are fairly narrow and some attendees are less considerate than others. As I arrived rather later than usual and the trader shall was heaving, I headed straight into the competition hall, as sometimes the table are worth looking at. Now, there are usually a few nice-ish tables on display, but nothing that usually makes me want to take out my camera. However, this year, there was, so I did actually take some photos. First, a rather nice 28mm Pegasus Bridge set-up for Bolt Action, which wasn’t actually being played upon, but I felt warranted a picture because it was so nice. Next up, one of several 28mm full-size galleons for a (probably) pirate-themed game. This one was the biggest and loaded to the gunnels with British seamen. The fort they were attacking was okay, but the ships themselves were lovely. The final table was probably another Bolt Action table, as it appears to be a war-torn city. An absolutely HUGE amount of detail – trains, planes, a crane, plumes of smoke, etc. Just click on the picture and enjoy. After wandering up and down the aisles for a while, I decided to brave the traders hall. And found it somewhat…lacking. It would appear that some of the standard traders that usually attend had decided to forego this year. And the traders who were there didn’t appear to have very much in the way of new stuff. A couple of manufacturers did – Sally 4th being one (as noted by Simon over at Fantorical) and Warbases, who have extended their range of laser-cut MDF buildings into several areas that I wasn’t aware of such as sci-fi, ancient Rome and soon to be the Orient. Worth a look on their website if you haven’t visited in a while, as their range has expanded a fair bit, their prices are reasonable and they have a good range of 28mm animals, should you need to populate your British countryside with both farm and wildlife. And it was Warbases who manged to part me from some of my cash, as they had a set of two MDF handcarts, complete with metal ‘loads’ and attendants. Ideal for adding to colour to your street-scenes and reasonably generic clothing-wise to be used from Victorian up to Post-war, as shown below. Two metal figures, two loads and two MDF handcarts…for £7.00. Bargain! Unsurprisingly, the handcarts don’t come with instructions, but it’s pretty obvious how they go together, with the T-shaped part being the stand which prevents it from tipping over – which will be used for the vegetable seller. So, a couple of likely lads ready and waiting to be purvey their wares on the streets of Blackwell. My only other purchase was the main reason for attending. Earlier in the year, Crooked Dice launched a Kickstarter for their ‘Children of the Fields’ range of figures and programme guide. Obviously, as this is Crooked Dice and 7TV, this was a range of creepy villagers, sinister Morris Men, devious Huntsmen, possibly possessed scarecrows and all the other various accoutrements of a 70’s British village that welcomes strangers, but doesn’t let them leave. I was almost tempted by this KS, but felt that for the models I did want, I’d end up with some models I didn’t. However, there was one model I knew I had to have. Now, I could have taken advantage of the ‘pledge a £1’ option that allowed you to just select an add-on, but I worked out that if I did this, the model I wanted would actually cost me more, taking into account the postage, than waiting until it was released and picking it up at Warfare. So that’s what I did…and here ‘he’ is. This is The Straw Man, an 80mm tall corn/wheat golem and he’s rather bloody cool. A nice three-part model which looks like it will go together with no issues, with nice, crisp detailing. Basically, it does look like it’s made of bundles of hay…or possibly “Shredded Wheat”. And, not being period specific, I can use this for Age of Unreason, Tales of the Black Museum, Ghostbusters, Scooby-Doo and even Doctor Who games should I wish. Now, it’s not cheap – being £15.00, but I do feel it’s worth it, as there is literally nothing else like it on the market. And if you want lesser minions for your giant Straw Man, Crooked Dice do a Straw Bear (which is a Morris Man dressed in sheafs of straw, rather than an actual bear), as part of the same range.